Bills fans are passionate about their team. Even the day before their wedding, they still make their way out to Ralph Wilson Stadium to support the Bills and celebrate the start to football. 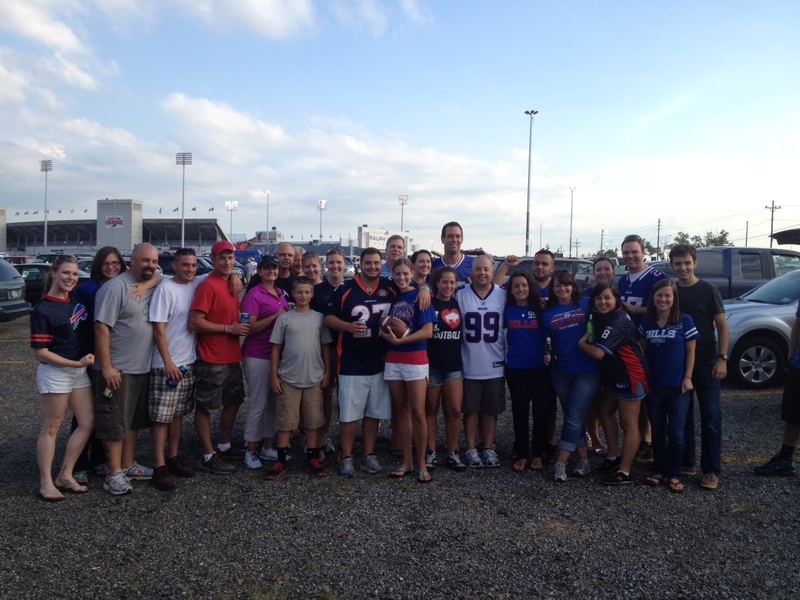 Season ticket holder David Roth’s cousin Dave and soon to be bride Megan are true Bills fans. Immediately following their rehearsal dinner Thursday night, they made their way to Ralph Wilson Stadium along with most of the wedding party to relax and watch some football. Planning this party started as soon as the schedule came out, as Dave describes the excitement when they saw the Bills preseason opener was the day before the wedding. Dave’s soon to be cousin Megan has been a Bills fan her entire life. Inviting everyone to the tailgate the day before her wedding was a no brainer. The tailgate is something that this season ticket holding crew will never forget. Relaxing and watching their favorite team put them at ease for the days to come.